Ten years ago individuals with celiac disease were advised against eating oats. 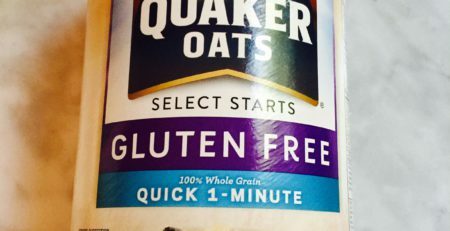 This was not because oats inherently contain gluten but because oats available commercially were highly likely to be contaminated with wheat or barley. Ten years ago we did not have oats that were specially produced and processed to be gluten-free. Today, thanks to the pioneering efforts of Cream Hill Estates, Avena Foods, Great Northern Growers/Montana Gluten-Free, and Gluten-Free Harvest specially produced and processed gluten-free oats and oat ingredients (e.g., rolled oats, steel cut oats, oat flakes, oat flour, oat bran, and oat groats) are available to gluten-free manufacturers and consumers. It is important to remember that there are two major activities required to bring gluten-free oats from field to table. The first is production, which takes place at the farm and involves seed sourcing and planting, growing, harvesting, transport and storage. The second is processing, which takes place at the mill and involves cleaning, mechanical sorting, dehulling, stabilizing against rancidity, and transforming into flakes, flour, steel-cut, whole groats, and bran for human consumption. Contamination can occur anywhere along this route. 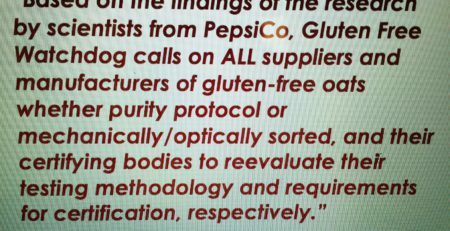 Here, for simplicity, Gluten Free Watchdog will use the term “produce” to refer to both production and processing. This protocol was developed out of necessity. These steps were needed to ensure a truly gluten-free oat supply for individuals with celiac disease. Presently, not all gluten-free manufacturers are sourcing their oats from suppliers of specially produced gluten-free oats who use ALL aspects of a purity protocol similar to the one above. Some manufacturers and suppliers may be sourcing “regular” oats from farms that have wheat or barley contamination in their fields or equipment. At least one manufacturer is using a proprietary mechanical process to remove wheat and barley from regular oats*. In addition, some suppliers MAY be using optical sorters in addition to conventional cleaning equipment to remove wheat and barley. 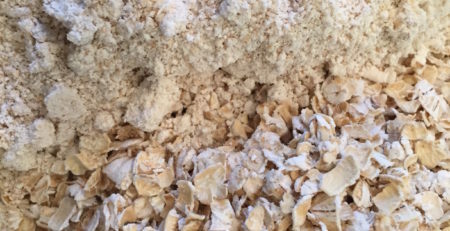 However, it is not clear how well these sorting processes work on “regular” oats from the standpoint of ensuring a consistently reliable source of gluten-free oats. For oat producers and processors that adhere to an established purity protocol, optical sorting (and other proprietary sorting processes) could be another important step in ensuring a “safe” source of oats for the celiac disease community. We know from a study published in 2004 that “regular” oats available in the US market cannot be considered gluten-free. Based on testing four different lots of three brands of oats, it is clear that oat contamination varies tremendously between brands and between lots of the same brand. There also may be a great deal of variation within the same lot, especially if the lots are large. This is why testing (and a lot of testing of representative samples) is necessary. Gluten Free Watchdog has tested a number of gluten-free and certified gluten-free oats and oat-containing foods. To date three products containing oats have tested at or above 20 parts per million of gluten. After two of these manufacturers changed oat suppliers the products tested below 20 parts per million of gluten at the time of retesting. The third product has not yet been retested. Note: It is the policy of Gluten Free Watchdog to retest products testing at or above 20 parts per million of gluten approximately one year after the original test date. In the United States, oats and oat-based ingredients (e.g., oat flour, etc) used in labeled gluten-free foods do NOT have to be specially produced “gluten-free oats.” In addition, the FDA has stated that the term “gluten-free” may be considered intervening material in an ingredients list because it is not part of the common or usual name for any ingredient (and therefore may be subject to misbranding regulations). As a consequence it is very difficult for consumers in the US to know whether an oat ingredient is specially produced to be gluten-free. Health Canada released a Notice of Intent to issue a Marketing Authorization (MA) to allow gluten-free claims for specially produced oats that do NOT contain more than 20 parts per million of gluten from wheat, rye, barley, or their hybridized strains, and for foods containing these “gluten-free oats” as ingredients when sold in Canada. 2. The “gluten-free oats” are clearly identified as such in all cases where ‘oats’ are referenced, including in the list of ingredients. The consultation period for this Marketing Authorization for labeling “gluten-free oats” in Canada recently ended. Gluten Free Watchdog will let you know when a decision has been made. We ask manufacturers to please use only specially produced gluten-free oats (as defined by Health Canada) in their labeled gluten-free products. It is the opinion of Gluten Free Watchdog that a truly gluten-free source of oats begins with the use of pure seed and follows an established purity protocol. At Gluten Free Watchdog we understand that there is promising technology with optical sorters and other proprietary mechanical sorting processes that allow oats to be processed to remove barley and wheat grain. More information is needed before we can assess whether these sorters will allow “regular” oats to be processed enough to effectively and consistently remove wheat and barley. 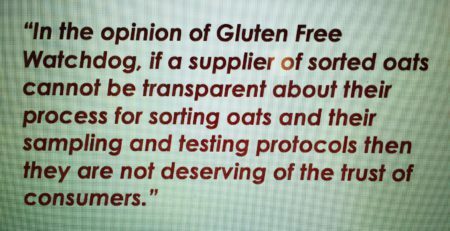 As always, Gluten Free Watchdog will continue to monitor the issues concerning the use and labeling of gluten-free oats. As a general rule, oats and oat products that are certified gluten-free by a third party certification organization are a good choice for consumers. There are some manufacturers who choose not to certify their products through a third party organization but nonetheless follow a strict purity protocol or source their oats from a supplier of certified gluten-free oats. At Gluten Free Watchdog we understand that this information may be confusing to consumers. It is hoped that the recommendations below will help you choose your oat products wisely. A huge THANK YOU to Amy Jones, MS, RD for her critical review of this article including multiple “read throughs” to help tweak the wording!! Another huge THANK YOU to those in the oat processing industry who were consulted for input. This article could not have been written without their help. © Copyright February 2015 by Tricia Thompson, MS, RD for Gluten Free Watchdog. All Rights Reserved.